Taking you on an electrifying visual and audio journey through the magic of Michael's 45 year musical history, you'll experience over two hours of non-stop hits from pop to rock, soul to disco. Paying homage to Jackson's legendary live performances and innovative dance moves executed with flair, precision and passion this is a show that you will never forget. 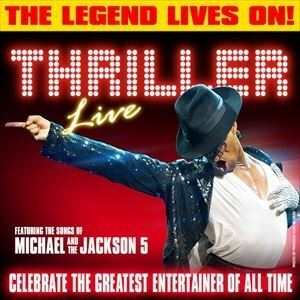 Expect your favourite songs delivered by an exceptionally talented cast and band, including: I Want You Back, ABC, Can You Feel It, Off The Wall, The Way You Make Me Feel, Smooth Criminal, Beat It, Billie Jean, Dirty Diana, Bad, Rock With You, They Don't Care About Us, Dangerous, Thriller plus many more! As Newmarket Nights is our Friday evening racing plus music events, artists take to the stage at any time from 8:30pm, our recommendation is that Newmarket Nights are not suitable for children under 16. Whilst we recommend that these events are not suitable for children under 16, if you do wish to bring them as part of your party, at your discretion, they can attend as long as they possess a valid ticket to gain entry and there is a responsible adult of 18 and above to every two children under 16. We take every precaution to try and ensure everyone has a safe and enjoyable time at all of our events. If you do decide to bring a child under 16, we would suggest against taking them into the most densely crowded areas, which includes the large area in front of the stage. Newmarket Racecourses have a range of family friendly events throughout the summer, including our popular Summer Saturday's series whereby children under 18 are permitted free. Our racing plus music afternoon events, Summer Saturday Live, are our family friendly events of this type which have an allocation of concession tickets for children available. It is your responsibility to check the suitability of an event for any children in your party regardless of official age restrictions, this includes considering the type of audience the event is likely to attract and whether such an audience is a suitable environment for children in your party. Refunds will not be issued if any aspect of an event, including the behaviour of other audience members, causes offence to you or any children on whose behalf you have purchased tickets. We do not recommend subjecting babies and young children to loud music. Children are recommended to wear hearing protection if you decide to bring them. A concert environment is not suitable for very young children.